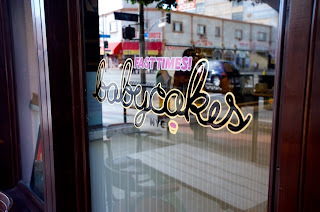 Well it's finally here: Babycakes has opened in Los Angeles! After more than a year in development and a location change, the bakery has opened at 130 East 6th Street in downtown. You regular readers may know that I'm practically a one-man marching band for Babycakes. I'm obsessed with their treats. I was recently in New York over New Year's and made sure to stop in at Babycakes' New York location at least three times... there may have been more visits, but I'm embarrassed to admit to them. Babycakes makes an amazing array of cupcakes, breads, donuts (yes, gluten free donuts!) and more. The shop's cupcakes were recently named one of the best in the U.S.A. Everything in the shop is also vegan. Be warned: there are some items that contain spelt. Every day the shop updates its in-store glass displays to match the baked goods behind the glass -- anything written in red contains spelt, an ancestor of wheat. Anything written in white is gluten free. Always be sure to ask whether the product you have ordered is gluten free to be safe! The treats themselves are, of course, wonderful. But better yet, the place has personality. Owner Erin McKenna has created hilarious dance videos (check out my personal favorite here) to hype up the shop. The vibe created in that dance video is carried into the design of the L.A. shop. With three tables inside and a table outside, the Los Angeles location is substantially larger than the New York location. The large, inviting windows are wonderful to soak up some of the L.A. sun while enjoying my personal favorite, the cookiewich. While at the shop today I spoke with the delightful owner, Erin McKenna. She told me that they are still in the process of introducing products often seen in the New York location to the Los Angeles location. Having been open for less than a week, Babycakes has a lot of time to continue proving itself to Los Angeles area celiacs and vegans. That being said, I've been taken with Babycakes since the first time I set foot in the Lower East Side location and am so happy I can finally continue my love affair with the bakery here in Los Angeles. The best part about the bakery's new Los Angeles location is that the quality of the New York location has translated seamlessly over to the west coast. Babycakes is definitely going to be my go to for any baked goods I need here in Los Angeles; the quality, freshness, and personality is unrivaled. 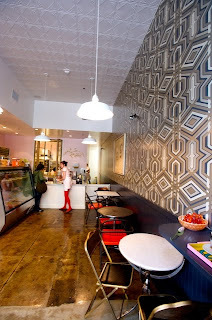 And really, where else can you find awesome, freshly baked gluten free donuts here in Los Angeles? I've kept this relatively short because I've blogged about Babycakes so many millions of times before. In summary, if you haven't been here and live in the L.A. metro area, you should drive, not walk or run (we do live in L.A. after all) to this shop immediately... as long as you aren't reading this when the shop is closed for the night. The photos are compliments of The Kitchy Kitchen.